You may have begun your fitness goals with the idea that you would eat little, to no, candy, but, calorie-rich goodies are just too hard to resist. So you decided, “I’m just going to cut them out altogether.”, but we all know that getting rid of sweet and salty foods can be very difficult, if not impossible. So, this article is going to do you nine favors. It’ll discuss nine candy bars that are the cream of the crop for your health, at least in terms of candy bars in general. These candy bars have relatively low calories and a lot of nutrients. By having healthy candy bars already on hand, it’ll be much easier for you to meet your fitness goals and feel good about each bite. 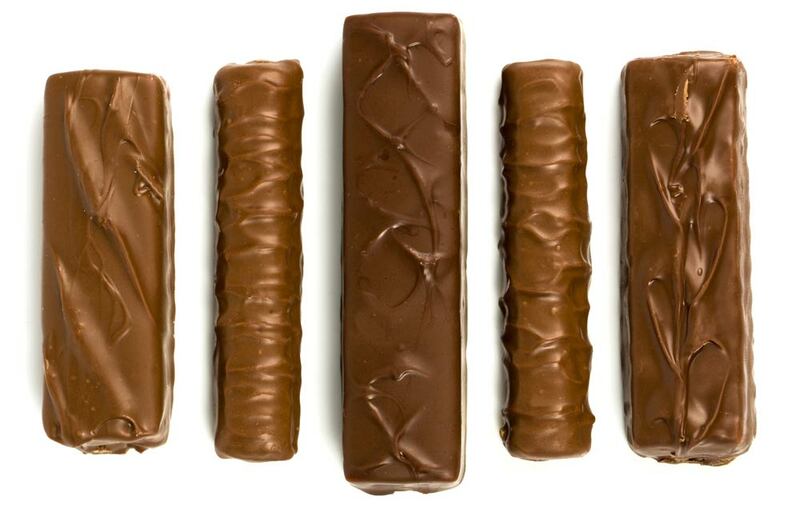 So, here are the nine candy bars that will save your diet and your sanity. Packing just 130 calories per bar Figamajigs achieve these lower calories because they’re made from figs. Though figs aren’t even close to cocoa, they have a texture similar to chocolate and a very sweet taste. Because of the lack of chocolate, these are somewhat low in fat. With 2.5 grams of fat and 5 grams of fiber, Figamajigs are a great candy bar when you’re watching what you eat. In addition, they include one gram of protein. These healthy, all-organic bars, as you would expect, more expensive than other less-healthy candy bars, but if you go to your local natural food store you can find these chocolatey, crispy and nutty candy bars. Each bar has 200 calories and about 7 grams of fat, half of which is saturated. So, when you’re looking for a Snickers bar you might want to grab a Crispy Cat Bar. You’ve most likely heard of Mounds. The clean ice blue and white package is both well-designed and well-known. It does wonders for the marketing of these chocolatey, coconut-filled, candy bars. At 195 calories per bar, Mounds shouldn’t be eaten in large quantities, but with 2 grams of protein, these amazing bars can keep your appetite satisfied for longer and curb the crash that usually comes after eating sugar. Similar to other candy bars, Mounds has 11 grams of fat, but the additional protein balances things, somewhat. With an amazingly memorable name, Chunkie candy bars actually have fewer calories than other candy bars of its kind. Included in this delicious candy bar is 173 calories, 10 grams of fat and 3 grams of protein. So, to reduce your risk of getting chunky, you may want to grab a Chunkie. These tiny circles of milk chocolate goodness are actually really good when your sweet tooth is craving more sweetness. When you head to your local grocery store and grab a 1 oz. tube you’ll be getting 150 calories and 7 grams of fat. Both of these numbers are on the lower end of the ingredients in most candy bars. Though M&M’s are not a traditional candy bar, they are really great for snacking over a period of time. Rather than biting off half and then biting the other half, you can slowly indulge your bratty sweet tooth by eating just one at a time. This may also increase your self-discipline, which could increase your happiness, health, and success. While the calories and fat of a 100 Grand Bar are still too high to place it in the healthy category, at 180 calories per bar and eight grams of fat, a 100 Grand bar is not as detrimental as you would think. For your health, bite into this crispy candy bar with creamy filling once in a while. Possibly the closest thing to heaven on earth, you’ll want to treat yourself to a 100 Grand bar. 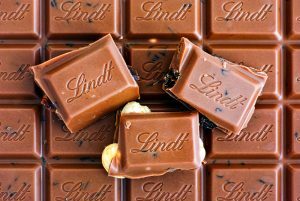 Those these candy bars are available in pretty much all drug stores and grocery stores, Lindt Chocolate Bars are boasting some high numbers, like, 250 calories,19 grams of fat. Of those 19 grams, these perfect square bars made with 70% cocoa, do include 12 grams of saturated fat. More numbers for your reading pleasure. Four squares of Lindt Chocolate Bars will get you 12 grams of sugar and 3 grams of fiber. To keep these within the healthy range you’ll want to eat just two. Of course, as you know, Lindt Chocolate Bars are very good so you’ll have to really psych yourself out when you open up one of these. But, you’ll be glad to know, the cocoa can add many antioxidants to your body. This candy bar includes almonds, which provide monounsaturated fats that help your heart and lower the sugar content to 16 grams. Dove Bars With Nuts pack 190 calories and a relatively high 12 grams of fat, of which six are unsaturated. The third upside? Because of the almonds, Dove Bars With Nuts is a healthier option. Nearly not making this list is Hershey’s Special Dark. This is an amazing candy bar, but in addition to that taste is 12.5 grams of fat, 21 grams of sugar and 195 calories per bar. Without candy bars, it’s nearly a fact that you’re my life won’t be as good. But, there’s no need to throw away every candy you have in your car, home, or desk. Just look for someone who needs them and pick up healthier options for yourself. Not only will you stick to your diet, you’ll build a great collection of healthier candy that will boost your mood, energy, and overall well-being. Possibly the healthiest candy that isn’t extremely expensive is Twizzlers. With their classic red and black twirls, Twizzlers have few calories and taste fantastic. So, you may want to stock up on these! Two miniatures and snack sizes are highly recommended for all of these candies. This is just enough to quiet your sweet tooth and keep calories and fat to a minimum.